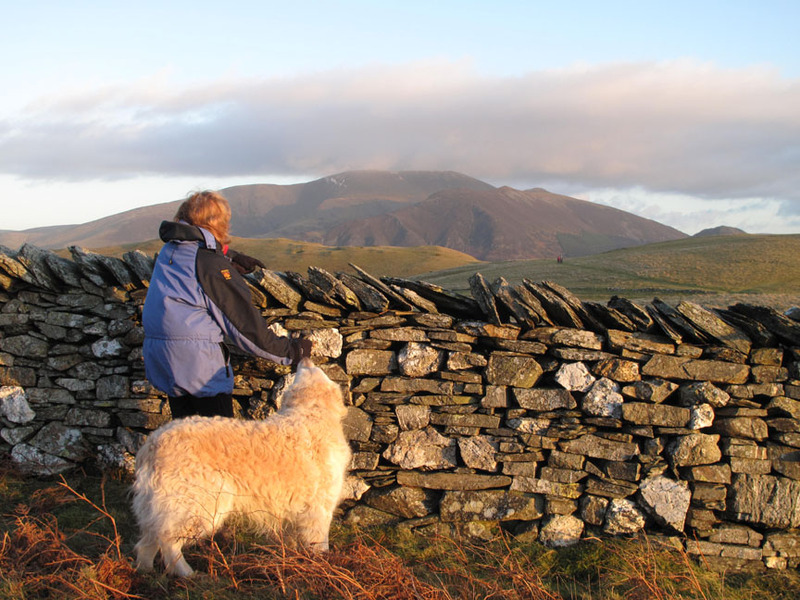 " Sale Fell ... 1st Fell for a While "
Date & start time: Thursday 5th January 2012, 3.30 pm start. 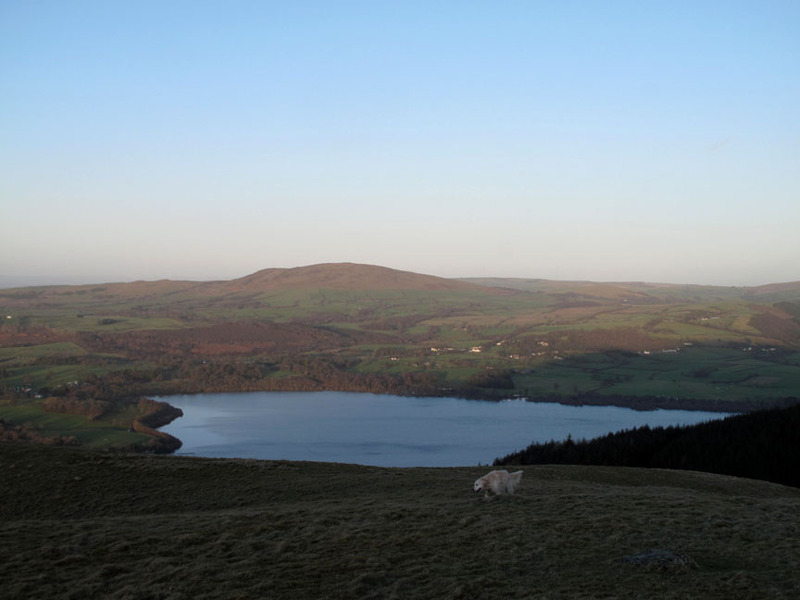 Places visited : Dodd Crag, Sale Fell, Kelswick Farm and back. 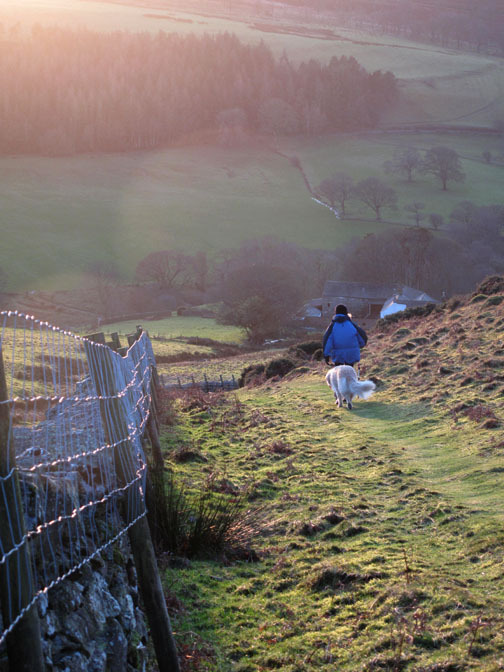 Walk details : 1.75 mls, 625 ft of ascent, 1 hour 15 mins. 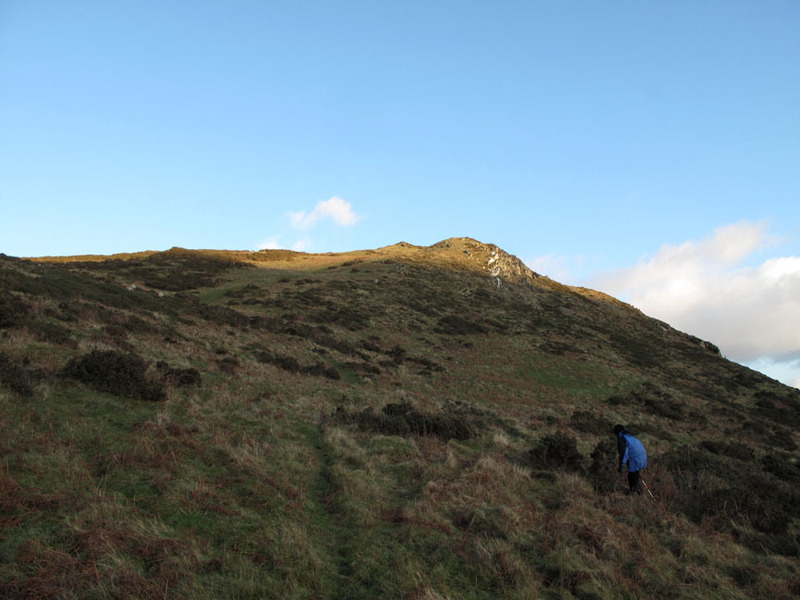 Highest point : Sale Fell, 1,177 ft - 359 m.
Weather : Sunshine and blue skies, albeit late in the day. the sun makes a lunchtime appearance and we get out for a walk in dry weather for a change. 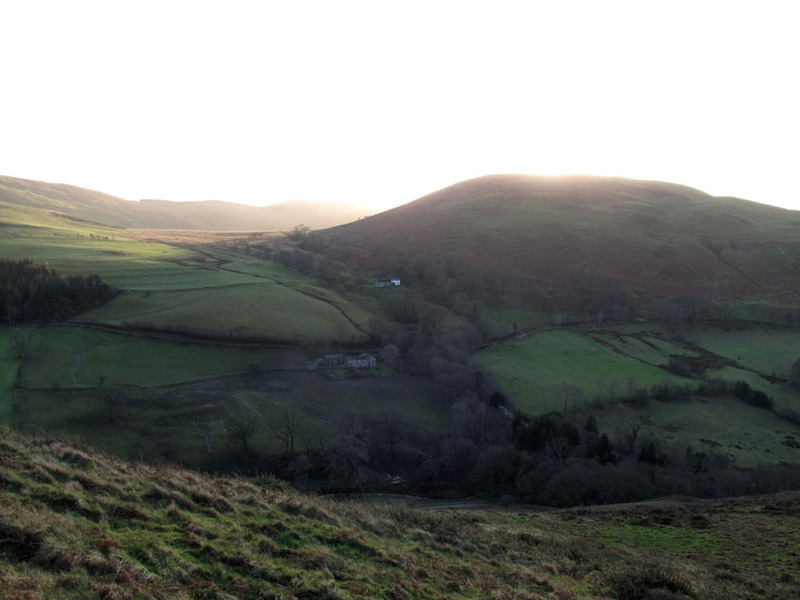 Sale Fell will nicely fill that hour between a delayed lunch and evening darkness. I think everyone else had a similar idea today. 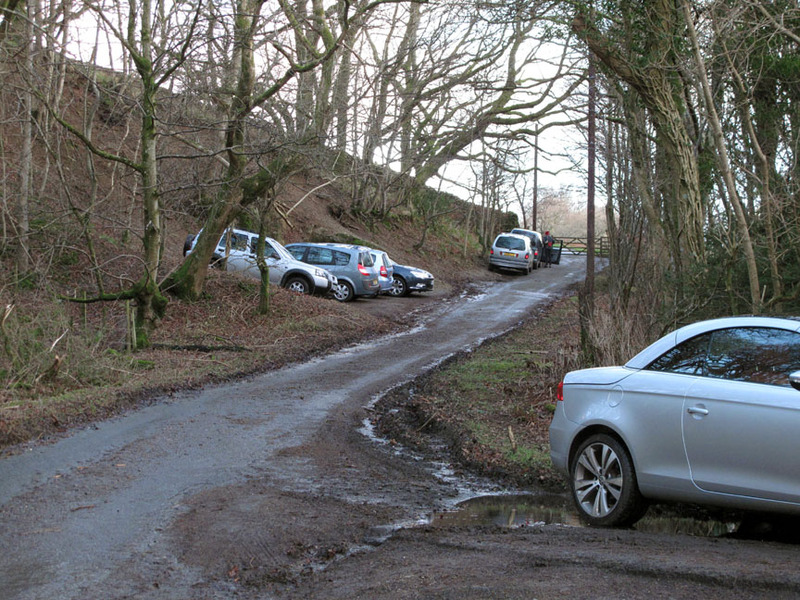 Parking at the road-end in the Wythop Valley is fairly congested. We walked up the road towards the gate. Just to confuse you that's not Ann or our dog up there . . . she turned sharp left at the gate. This gave us direct access to the heights . . . (i.e. 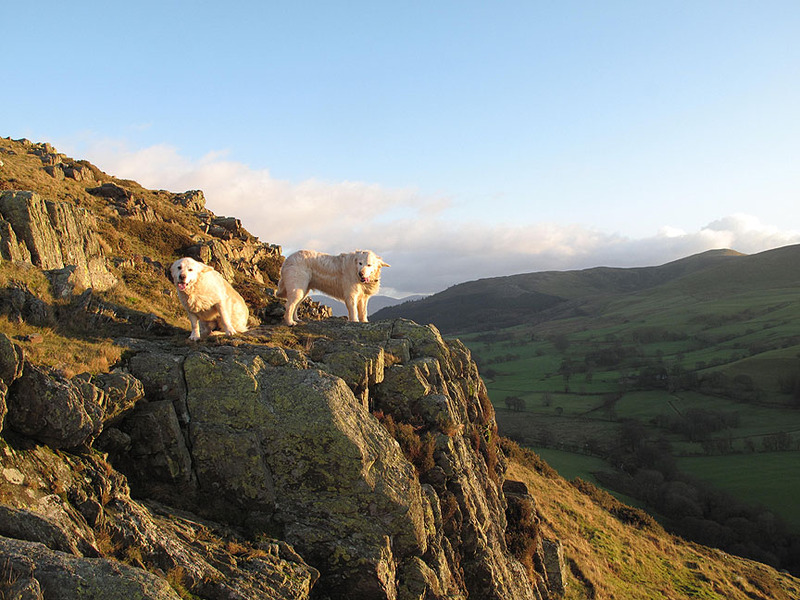 straight up the fell). 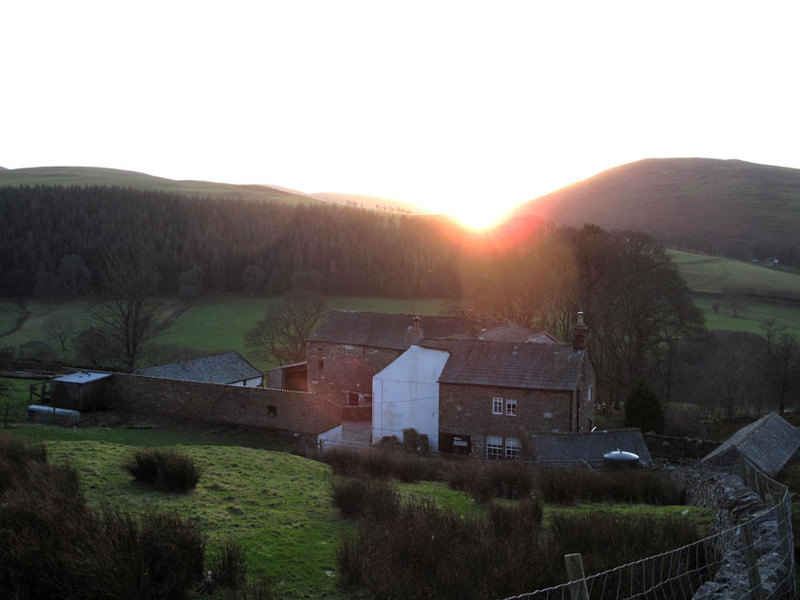 Sun rise over Ling Fell. To be fair, the sun was setting but we were rising faster, so we climbed into the sunshine. 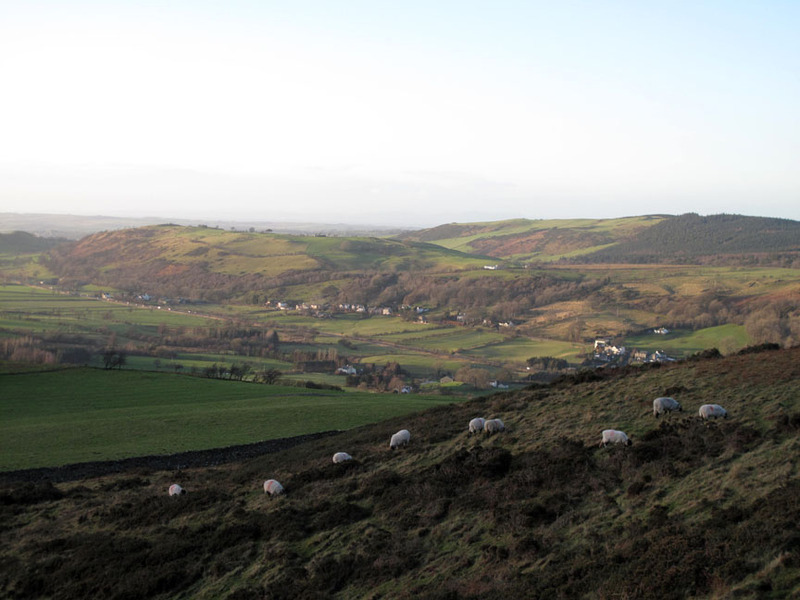 Looking back at Embleton, the linear village stradling the A66 main road between Dubwath and Cockermouth. 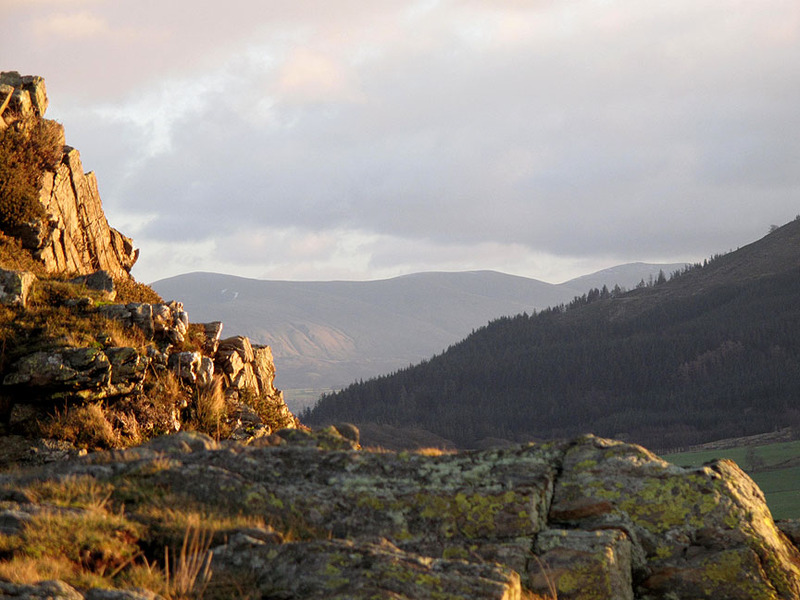 A view of the distant Helvellyn Dodds . . . but the dogs got in the way. Their ears give a clue to the strength of the NW wind up here. Helvellyn's Dodds from Sale Fell's Dodd Crag . . . one minute later. 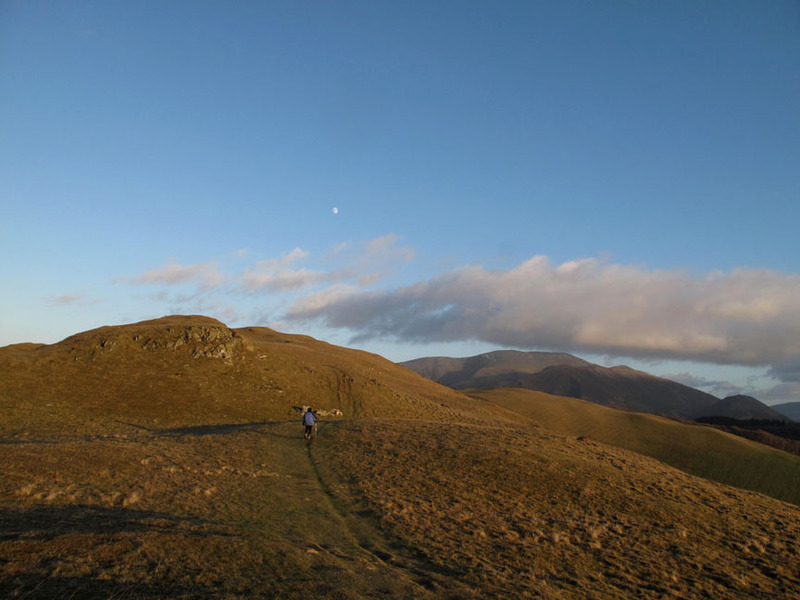 The moon is out above the fells as Ann continues on towards the summit. 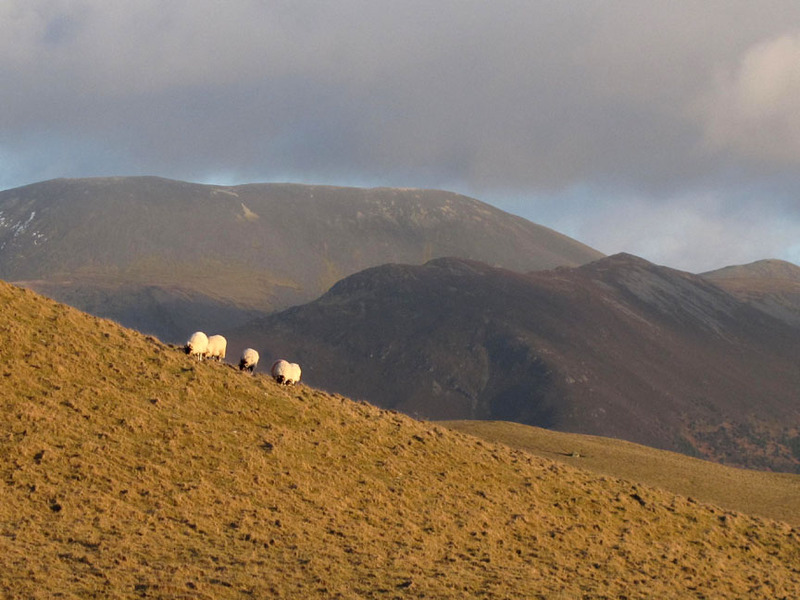 Skiddaw and Ullock Pike, with some locals in the foreground. seen across the water at the bottom end of Bassenthwaite Lake. 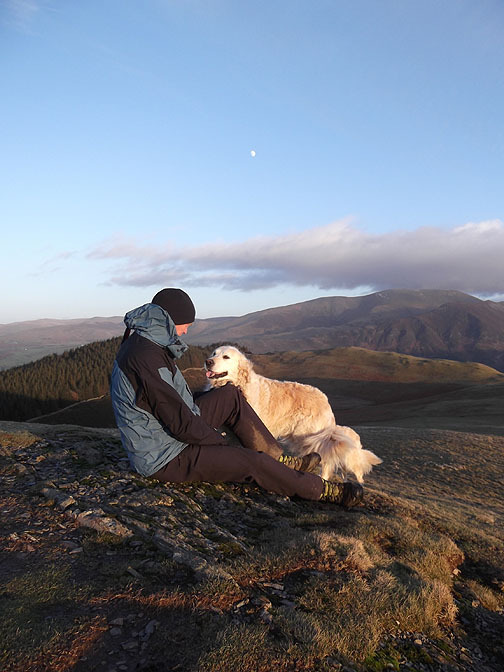 Myself and Harry at the windy summit of Sale Fell. That Scottish hill beginning with "C" in the far distance. As we haven't mentioned it for a while (because we haven't been out for a while) I suppose we had better tell you that it's Criffel. 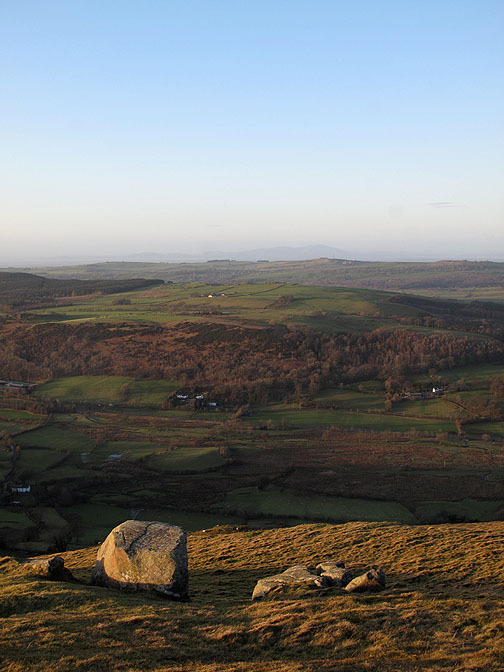 Click here or on the picture for a larger panorama from the summit of Sale Fell. Down the other side, from the summit to the wall. Ann stops to take in the sights before we leave the view behind. Hold your cursor over the picture to give Harry a better view. 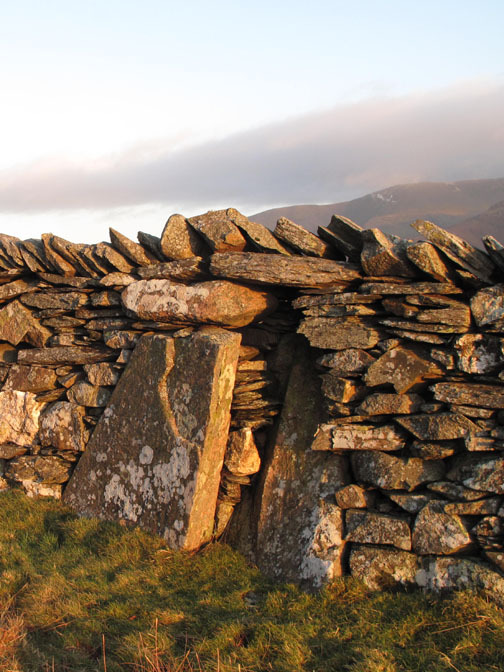 Detail of the stone craft evident within the wall. 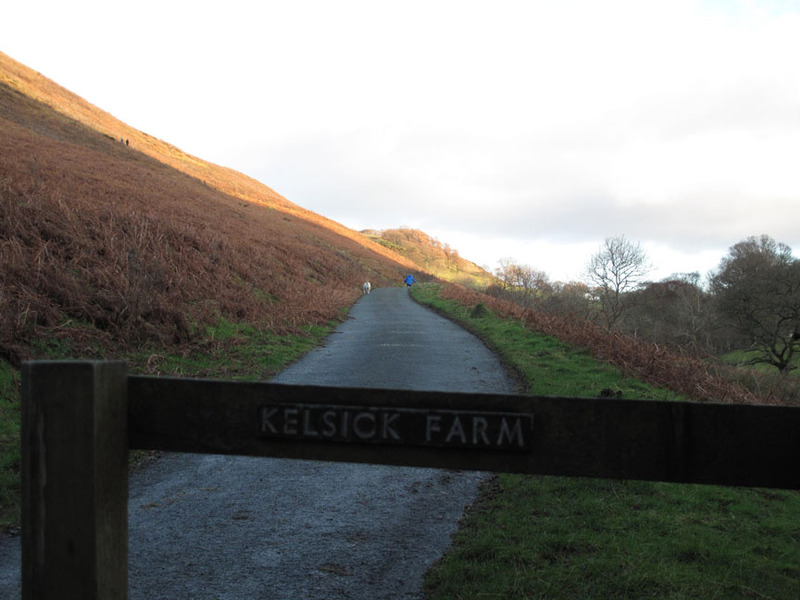 Modern fencing leads back to Kelswick Farm. Kelswick Farm as we return to the car. This is one of the few farms in the valley and is well equipped with large barns surrounding the well protected courtyard. What with that, and the obvious signs of field systems and arable land on Sale Fell summit, the whole area begs for more investigation. Still . . . no time today as we have to get into Cockermouth before the shops shut ! 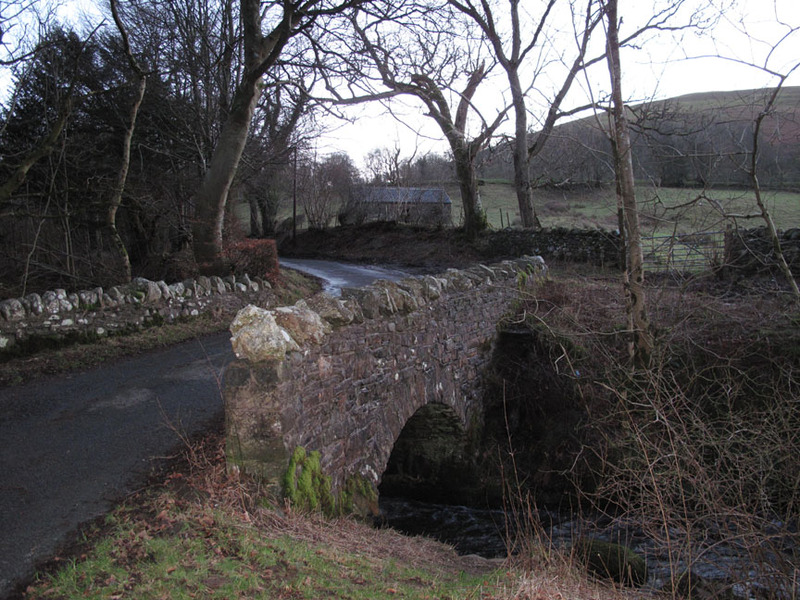 Brumston Bridge . . . that means we're back at the car. A great hour and a bit walk and nice to be out on the fells again after such a long period of poor weather. This site best viewed with . . . " Sunshine after the rain "